The completed rebuild of a unique, eco-friendly and highly energy efficient house in Melbourne, featuring Stegbar windows and doors, has resulted in an extraordinary sustainable home in an exceptional setting that provided many challenges to overcome – including a running creek prone to flooding. Located on Jeffery Street – a National Heritage street in Blackburn known as one of the most unique native environments in residential Melbourne, the project consisted of building a new four-bedroom home with three bathrooms and three living areas, including an alfresco entertaining space. The design brief stipulated two key areas – to take advantage of the unique surroundings with north-east aspect and views to create an open plan home connected to the landscape, and for the home to have good green credentials, while sitting lightly into its environment. Siteline windows and doors are a unique design combining the beauty and warmth of a timber window on the inside with the durability and practicality of aluminium on the outside. The end result is a stunning, green, sustainable house in a very special location with an exceptionally unique setting. The home won the Single House – New Dwelling category in the City of Whitehorse 2017 Built Environment Awards. 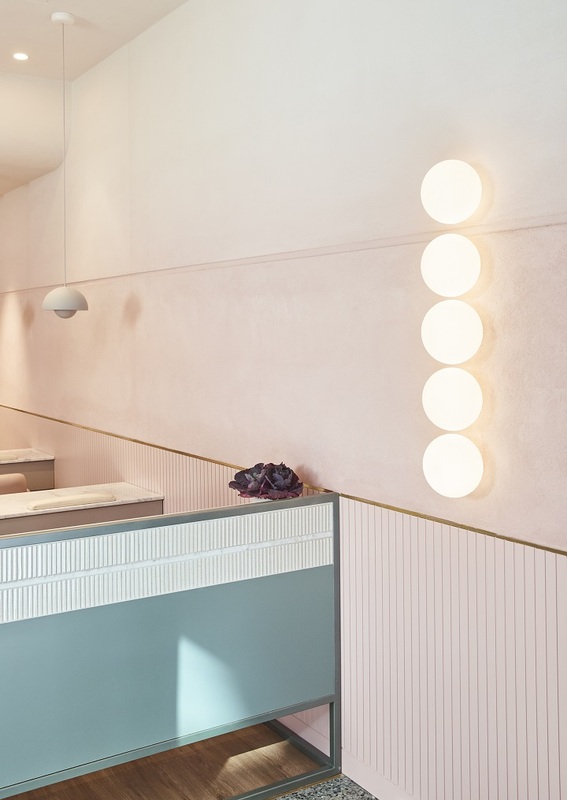 A far cry from the typical nail salon, California Nails is a new nail salon in Barangaroo, Sydney, designed by TomMarkHenry. It is a soft, feminine and dreamy space inspired by vintage Californian imagery. Gently dusted in powder pink with hints of blue-green and burgundy to enhance a vintage inspired Golden State vibe, the salon’s curvaceous features, customised fittings and textured accents create a soft and feminine environment that breaks the mould to deliver a nail salon like no other. 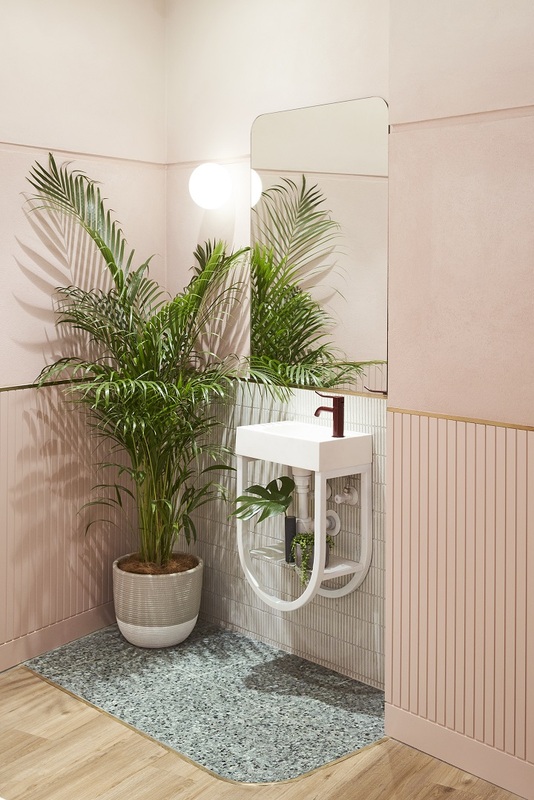 “Our brief was to reinvent the California Nails brand by creating a soft and feminine environment, a far cry from the typical nail salon that tends to lack warmth and soul,” says Jade Nottage, Director of TomMarkHenry. 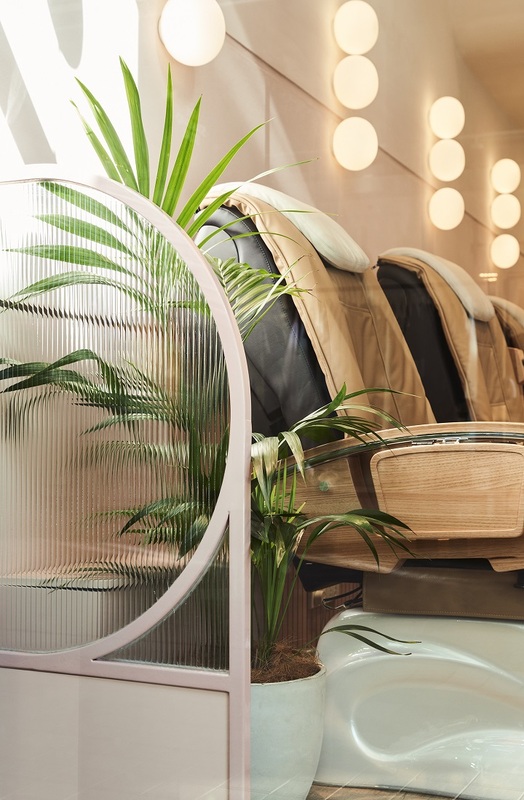 The design and construction of California Nails meets Barangaroo’s Green Star rating requirements, minimising the salon’s carbon footprint and contributing to the development’s target to become Australia’s first large-scale carbon neutral community. 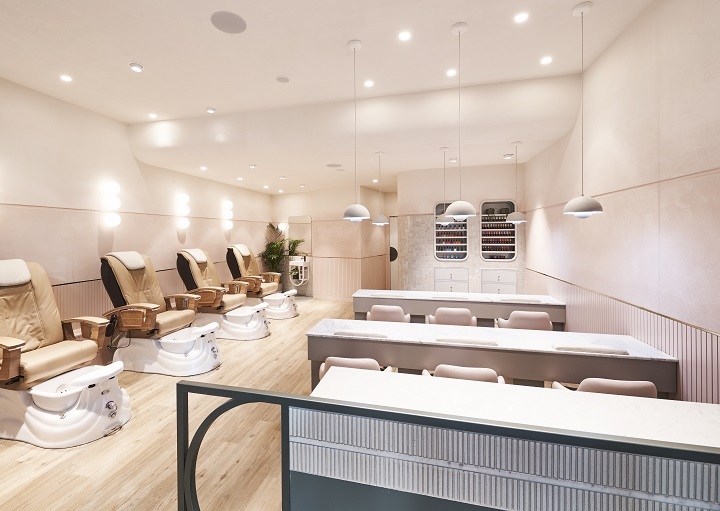 The TomMarkHenry design team also selected materials that balance the chemical component of the manicure process, using an environmentally friendly clay-based render that helps to clean the air and control humidity. TomMarkHenry thrives on the creative and collaborative development of unique and exceptional spaces, and its authentic and adaptable approach ensures the dynamic studio continues to push the boundaries of design and expectation with spaces such as California Nails. Now who wants to meet up for a Mani Pedi? I do!! Fish Creek House by Editon Office was the winner of 'New House over 200m2' category in the Houses Awards 17 - which was announced this month. "The Fish-Creek house is contained within the singular gesture of a long, highly textured wall, which closely wraps three nested, black timber pavilions offering shelter while they sit upon the lowered wall and gaze out upon the undulating and extraordinary landscape that surrounds them." We love the modern simplicity of this single story dwelling, the use of brick to add texture and the way it fits into it's surrounding landscape. 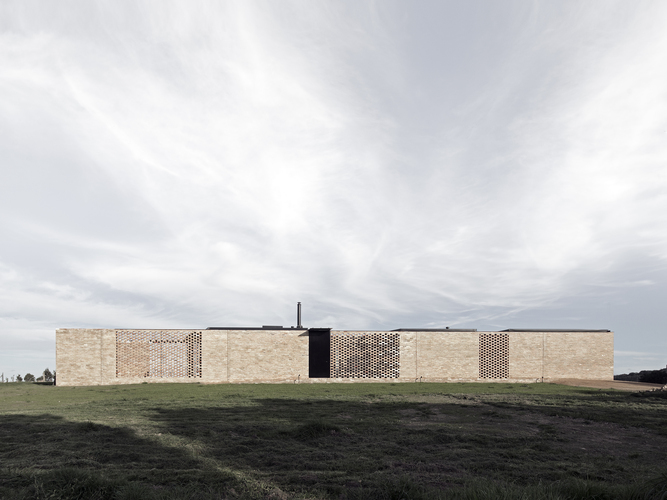 "An abstract object sits embedded in the landscape - a long, highly textured wall wrapping three black timber pavilions and enclosing five courtyards. The structures offer shelter from the at-times harsh climate, as well as views over the extraordinary landscape and coastline to the east. The textured brick wall, with its carefully curated mortar jointing, anchors the building to the site. Its earthen materiality is attuned to the landscape, mediating between screening a busy road to the west and opening up to the view. The planning of the house into three discrete pavilions separated by courtyards allows for the entry of northern light along its length, and for the incremental shutting down or opening up of the house to suit either its owners - an elderly couple - or larger family gatherings. Building a sizeable project with a high level of quality and detail on a relatively modest budget is a significant achievement in itself. This project goes much further - it offers an alternative model for ageing in place, with careful consideration of the single-level plan, the accessibility of bathrooms, access to outdoor spaces and an acute awareness of scale." With 2020 just around the corner I think we all believed we would be in our flying cars by now, instead we are grappling with the fact that we are slowly but surely destroying our planet and something big needs to change. From a design and building perspective, one thing that we can do to help bring about positive change for the planet is to focus on sustainable architecture and design. We need to build a greater and more sustainable world for future generations. By changing the way we look at architecture, design and building practices we can potentially combat some of the big issues and create innovative adjustments that will make a difference now and also moving forward. Eco-friendly architecture can mean many things but first and foremost it means green/sustainable building - ensuring the structure and building work is environmentally responsible and resource-efficient throughout its entirety, thus becoming a liveable design. Everyday more and more new construction technologies are being developed to ensure that we, as the generations responsible for ‘now’, are moving towards a sustainable future. We need to reduce our carbon footprint and celebrate renewable resources, which in turn will make an impact as soon as possible. Giving back to the environment through thoughtful, clever design and building will ensure that we slow the decline and aim for a more sustainable future. New technologies see us being able to use less water as well as collect it in the process and we can now save energy as well as create it. In addition to new technologies, designing a building to benefit from the natural flow of light and air is a valuable resource; taking advantage of what nature has to offer us from the beginning is the key to changing the way we design structures. On top of everything else, construction materials play a big part when building for sustainable living. Using reclaimed materials, like wood, recycled glass, using biodegradable paint and recycled metal make a huge impact locally and globally. Looking ahead can sometimes be a scary concept, however if we act more purposefully now, we can ensure prosperity for the future generations. The world’s purest, most irresistible water is now delivered in 8 stunning new colours. The coveted Zip HydroTap has had a stunning colour makeover. Australian design success story, Zip Water, has launched its new revolutionary Platinum Design Range featuring 8 gorgeous new HydroTap colours for contemporary kitchens. Be prepared to enjoy stunning new on-trend looks and brilliant functionality with crystal clear, boiling, chilled or sparkling filtered water at your fingertips. 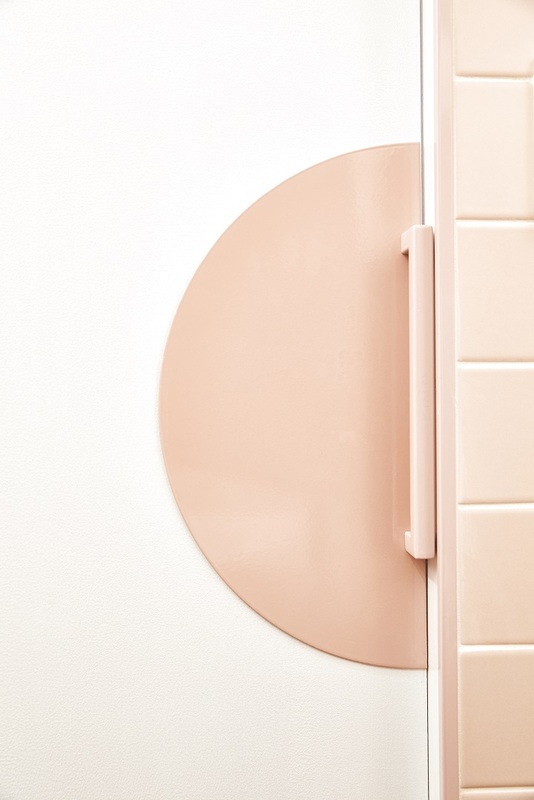 Choose from striking new looks including rose gold, brushed rose gold, gold, brushed gold, platinum, gunmetal, brushed nickel and nickel to match your kitchen design perfectly. And, of course, the new Zip Platinum Design Range still incorporates the latest innovative technologies for instant water of unparalleled purity. The range still features superb user-friendly operation – a single lever allows you to select filtered boiling, chilled or sparkling water as you wish. Also included in the design is the amazing Zip 0.2 micron filtration system – which instantly delivers the purest, tastiest water free from dirt and contaminants. Bindle… Gift Baskets that are ethical and stylish! Something new for you today and I just know that you are going to love this concept as much as me, thank me later! Bindle is an online Australian eco gift store that blends sustainability with style. With artistic license, gift 'hampers' are replaced by 'bindles'. Tailored around a specific theme or occasion, Bindle presents gifts for men, women, mothers, babies, and corporate clients alike. Bindle presents its customers with gift baskets and boxes throughout Melbourne and wider Australia that are made from boutique Australian-made food, wine and design gift items. They make an excellent alternative to traditional gift hampers. If you want to keep the environment in mind when purchasing housewarming gifts, items for clients or employees or alternatives to Christmas gift hampers, then Bindle is the perfect choice. These gift baskets come complete in hand-crafted Bindle signature gift boxes, which are enclosed in high-quality wrapping paper. The wrapping of each individual bindle is a stylistic nod to Japanese origami, and is completed using only tying and folding – with no staples or tape to be seen. Because of this, the process of unwrapping a bindle is an experience in itself, and the wrapping is in itself a precious gift. I am so in love with this brand and the quality and thought that goes into each and every one of these truly stunning 'bindles'… I know where I'll be going for all my presents from now on! Turners beach house, Grand Designs Australia... and it happens to be my sister and brother in laws house! In exciting news... my super talented sister and her husband have just completed their stunning house in Turners Beach, Tasmania and it was just recently aired on Grand Designs Australia. My brother in-law Nigel is a Draftsman and a conservationist at heart – a passion he shares with my sister Nina, a school teacher. They love the natural environment and have managed to secure one of the last remaining native bush blocks in Turners Beach, a beachside suburb on Tasmania’s north coast. Nigel was determined to keep their block in its natural state, by hoping to keep as many trees as possible and to build around them. 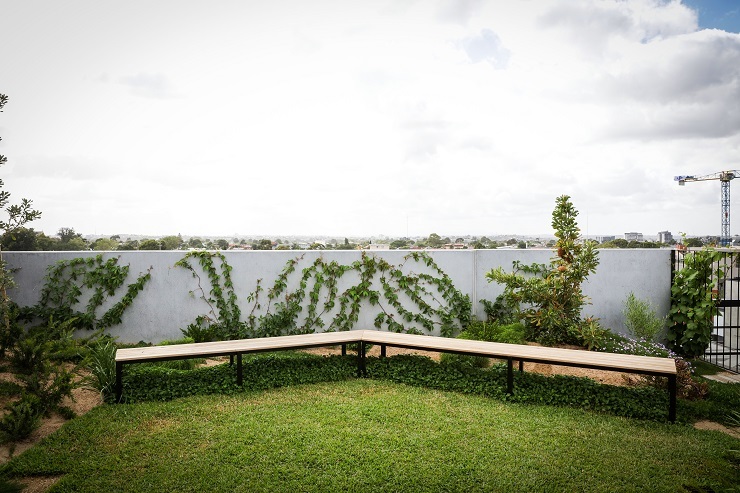 And then he took it one step further, by making a feature of the tallest tree on the site – a 30 metre eucalyptus, a tree he had always planned on incorporating into the build. The result is a house at one with nature, that seamlessly floats among the trees and makes you feel like you are always on holiday… and trust me when I say that the window box is mine whenever I step foot into their home! Scroll down for a selection of stunning images of their home or read their full story by clicking here or check out their supplier list by clicking here.